Theoretically, it would be a great story for the American press: an autocrat so obsessed with overthrowing the leader of a neighboring country that he authorizes his intelligence services to collaborate with terrorists in staging a lethal sarin attack to be blamed on his enemy and thus trick major powers to launch punishing bombing raids against the enemy’s military. And, after that scheme failed to achieve the desired intervention, the autocrat continues to have his intelligence services aid terrorists inside the neighboring country by providing weapons and safe transit for truck convoys carrying the terrorists’ oil to market. The story gets juicier because the autocrat’s son allegedly shares in the oil profits. But the problem with this story, as far as the American government and press are concerned, is that the autocratic leader, President Recep Tayyip Erdogan, is in charge of Turkey, a NATO ally and his hated neighbor is the much demonized Syrian President Bashar al-Assad. Major U.S. news outlets and political leaders also bought into the sarin deception and simply can’t afford to admit that they once again misled the American people on a matter of war. Image: Turkish President Recep Tayyip Erdogan. The Official Story of the sarin attack – as presented by Secretary of State John Kerry, Human Rights Watch and other “respectable” sources – firmly laid the blame for the Aug. 21, 2013 atrocity killing hundreds of civilians outside Damascus on Assad. That became a powerful “group think” across Official Washington. However, as with the “certainty” about Iraq’s WMD a decade earlier, Every Important Person shared the Assad-did-it “group think.” That meant — as far as Official Washington was concerned — that Assad had crossed President Barack Obama’s “red line” against using chemical weapons. A massive U.S. retaliatory bombing strike was considered just days away. But Obama – at the last minute – veered away from launching those military attacks, with Official Washington concluding that Obama had shown “weakness” by not following through. What was virtually unreported was that U.S. intelligence analysts had doubts about Assad’s guilt and suspected a trap being laid by extremists. The supposedly conclusive proof against Assad came in a “vector analysis” developed by Human Rights Watch and The New York Times – tracing the flight paths of two rockets back to a Syrian military base northwest of Damascus. But that analysis collapsed when it became clear that only one of the rockets carried sarin and its range was less than one-third the distance between the army base and the point of impact. That meant the rocket carrying the sarin appeared to have originated in rebel territory. It remained easier for The New York Times, The Washington Post and other premier news outlets to simply ignore the compelling tale of possible Turkish complicity in a serious war crime. After all, what would the American people think if – after the mainstream media had failed to protect the country against the lies that led to the disastrous Iraq War – the same star news sources had done something similar on Syria by failing to ask tough questions? It’s also now obvious that if Obama had ordered a retaliatory bombing campaign against Assad in 2013, the likely winners would have been the Islamic State and Al Qaeda’s Nusra Front, which would have had the path cleared for their conquest of Damascus, creating a humanitarian catastrophe even worse than the current one. But that imperative – not to admit another major mistake – means that the major U.S. news media also must ignore the courageous statements from Eren Erdem, a deputy of Turkey’s main opposition Republican People’s Party (CHP), who has publicly accused the Erdogan government of blocking an investigation into Turkey’s role in procuring the sarin allegedly delivered to Al Qaeda-connected terrorists for use inside Syria. In statements before parliament and to journalists, Erdem cited a derailed indictment that was begun by the General Prosecutor’s Office in the southern Turkish city of Adana, with the criminal case number 2013/120. Erdem said the prosecutor’s office, using technical surveillance, discovered that an Al Qaeda jihadist named Hayyam Kasap acquired the sarin. Erdem said the released operatives were allowed to cross the border into Syria and the criminal investigation was halted. Erdem’s disclosures, which he repeated in a recent interview with RT, the Russian network,prompted the Ankara Prosecutor’s Office to open an investigation into Erdem for treason. Erdem defended himself, saying the government’s actions regarding the sarin case besmirched Turkey’s international reputation. He added that he also has been receiving death threats. Meanwhile, President Erdogan faces growing allegations that he tolerated the Islamic State’s lucrative smuggling of oil from wells in Syria through border crossings in Turkey. Those oil convoys were bombed only last month when Russian President Vladimir Putin essentially shamed President Obama into taking action against this important source of Islamic State revenues. Though Obama began his bombing campaign against Islamic State targets in Iraq and Syria in summer 2014, the illicit oil smuggling was spared interdiction for over a year as the U.S. government sought cooperation from Erdogan, who recently acknowledged that the Islamic State and other jihadist groups are using nearly 100 kilometers of Turkey’s border to bring in recruits and supplies. Russian officials expressed shock that the Islamic State was allowed to continue operating an industrial-style delivery system involving hundreds of trucks carrying oil into Turkey. Moscow also accused Erdogan’s 34-year-old son, Bilal Erdogan, of profiting off the Islamic State’s oil trade, an allegation that he denied. The Russians say Bilal Erdogan is one of three partners in the BMZ Group, a Turkish oil and shipping company that has purchased oil from the Islamic State. The Malta Independentreported that BMZ purchased two oil tanker ships from the Malta-based Oil Transportation & Shipping Services Co Ltd, which is owned by Azerbaijani billionaire Mubariz Mansimov. Another three oil tankers purchased by BMZ were acquired from Palmali Shipping and Transportation Agency, which is also owned by Mansimov and which shares the same Istanbul address with Oil Transportation & Shipping Services, which is owned by Mansimov’s Palmali Group, along with dozens of other companies set up in Malta. The Russians further assert that Turkey’s shoot-down of a Russian Su-24 bomber along the Syrian-Turkish border on Nov. 24 – which led to the murder of the pilot, by Turkish-backed rebels, as he parachuted to the ground and to the death of a Russian marine on a rescue operation – was motivated by Erdogan’s fury over the destruction of his son’s Islamic State oil operation. Erdogan has denied that charge, claiming the shoot-down was simply a case of defending Turkish territory, although, according to the Turkish account, the Russian plane strayed over a slice of Turkish territory for only 17 seconds. The Russians dispute even that, calling the attack a premeditated ambush. New York Times columnist Thomas L. Friedman expressed the prevailing attitude of Official Washington by ridiculing anyone who had praised Putin’s military intervention in Syria or who thought the Russian president was “crazy like a fox,” Friedman wrote: “Some of us thought he was just crazy. The smug contempt that the mainstream U.S. media routinely shows toward anything involving Russia or Putin may help explain the cavalier disinterest in NATO member Turkey’s reckless behavior. Though Turkey’s willful shoot-down of a Russian plane that was not threatening Turkey could have precipitated a nuclear showdown between Russia and NATO, criticism of Erdogan was muted at most. Similarly, neither the Obama administration nor the mainstream media wants to address the overwhelming evidence that Turkey – along with other U.S. “allies” such as Saudi Arabia and Qatar – have been aiding and abetting Sunni jihadist groups, including Al Qaeda and Islamic State, for years. Instead, Official Washington plays along with the fiction that Saudi Arabia, Turkey and others are getting serious about combating terrorism. The DIA analysts already understood the risks that AQI presented both to Syria and Iraq. The report included a stark warning about the expansion of AQI, which was changing into the Islamic State. The brutal armed movement was seeing its ranks swelled by the arrival of global jihadists rallying to the black banner of Sunni militancy, intolerant of both Westerners and “heretics” from Shiite and other non-Sunni branches of Islam. The goal was to establish a “Salafist principality in eastern Syria” where Islamic State’s caliphate is now located, and that this is “exactly what the supporting powers to the opposition” – i.e. 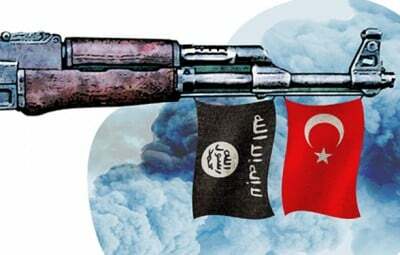 the West, Gulf states, and Turkey – “want in order to isolate the Syrian regime,” the DIA report said. Despite these occasional bursts of honesty, the U.S. government and the mainstream media have put their goal of having another “regime change” – this time in Syria – and their contempt for Putin ahead of any meaningful cooperation toward defeating the Islamic State and Al Qaeda. This ordering of priorities further means there is no practical reason to revisit who was responsible for the Aug. 21, 2013 sarin gas attack. If Assad’s government was innocent and Ergogan’s government shared in the guilt, that would present a problem for NATO, which would have to decide if Turkey had crossed a “red line” and deserved being expelled from the military alliance. But perhaps even more so, an admission that the U.S. government and the U.S. news media had rushed to another incorrect judgment in the Middle East – and that another war policy was driven by propaganda rather than facts – could destroy what trust the American people have left in those institutions. On a personal level, it might mean that the pundits and the politicians who were wrong about Iraq’s WMD would have to acknowledge that they had learned nothing from that disaster. It might even renew calls for some of them – the likes of The New York Times’ Friedman and The Washington Post’s editorial page editor Fred Hiatt – to finally be held accountable for consistently misinforming and misleading the American people. So, at least for now — from a perspective of self-interest — it makes more sense for the Obama administration and major news outlets to ignore the developing story of a NATO ally’s ties to terrorism, including an alleged connection to a grave war crime, the sarin attack outside Damascus. Investigative reporter Robert Parry broke many of the Iran-Contra stories for The Associated Press and Newsweek in the 1980s. You can buy his latest book, America’s Stolen Narrative, either in print here or as an e-book (from Amazon andbarnesandnoble.com).